With the analysis systems in CDR FoodLab® range, in just 4 minutes, without titration, using micro quantity of sample you can carry out the Peroxide Value test of edible Oils and fats like Olive oil, Nuts oil, Walnut oil, Peanut oil, Sunflower oil, castor oil, Palm oil and the other vegetable oils, butter, margarine, Fish oil, coocking oil, animal fats and so on. Absolutely no preparation for oil sample and a really easy one for fat sample. The results are comparable to AOCS Official Method Cd 8-53. Rapids results: 4 minutes ISO/AOCS compliant method. Simple method: photometric method, low toxicity reagents pre-filled in disposable cuvettes. test using micro-samples:suitable even to test fat substances that have a difficult extraction process. CDR method shows a very good correlation with AOCS Official Method Cd 8-53. 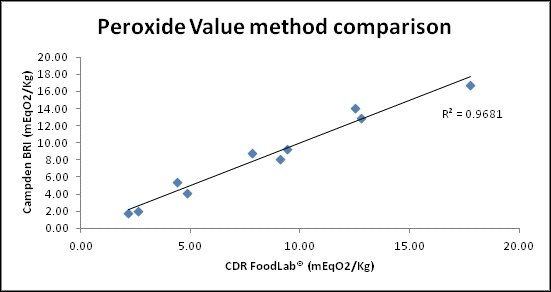 Furthermore Peroxide Value was determined using the CDR FoodLab® instrument and the UKAS accredited titration method used by Campden BRI (Campden BRI Method TES-AC-360). The data for PV using the CDR FoodLab® was found to be very consistent with good reproducibility across the triplicate runs and the correlation between the two methods is good. R-O-O-R peroxide value oxidize Fe2+ ions. The Fe3+ ions resulting from oxidation are grouped and form a red complex. Its colorimetric intensity, measured at 505 nm, is directly proportional to the concentration of peroxide value in the sample. Results are expressed as meqO2/Kg. The amount of peroxide value of fats indicate the degree of primary oxidation and therefore its likeliness of becoming rancid. A lower number of peroxide value indicates a good quality of oil and a good preservation status. Unsaturated free fatty acids react with oxygen and form peroxide value, which determine a series of chain reactions that generate the production of smelling volatile substances. Those reactions are accelerated by high temperature and by light and oxygen exposure. CDR innovative method simplifies and speeds up the standard procedure, because it enables the analysis to be carried out using micro-quantities of samples and to be applied to fats that are difficult to extract. For samples, with high acidity, where a dilution is requested, you must use an appropriate reagent kits. Oil as is (olive oil, extracted from seeds, nuts, etc.). Solid fats: melted using bain-marie method before starting the test (animal fats, palm oil, etc.). Specific curves suitable for the analyzer CDR OxiTester. Specific curves suitable for the analyzer CDR FoodLab® for fats and oils. The curves 50µL and 25µL are mainly recommended for refined oils with very low Peroxide Value, requiring great precision to values lower than 1. The curve 5µL can be used for refined oils and non-refined with Peroxide Value below 25. The curve 5µL is the same for the analysis of fats, but in this case it is necessary to make a small sample treatment. The curves are the same for the analysis of fats, these are the most suitable rangefor the application of dried fruit nuts. The oil is extracted by pressure through the system CDR cold extraction. Specific curves suitable for the analyzer CDR PalmOilTester. To carry out the analysis of peroxide in the flour is sufficient a very easy sample preparation. Peroxide Value was last modified: February 26th, 2019 by CDR s.r.l.